The ColdCure® Side Shoulder Wrap is designed to relieve the pain, swelling and inflammation of soft tissue injuries in the side of the shoulder. This includes Rotator Cuff injuries, Upper Bicep Tendinitis, Deltoid injuries, and repetitive strain injuries. Muscle, tendon and ligament injuries can all be healed quickly and effectively with a ColdCure® Side Shoulder Wrap. 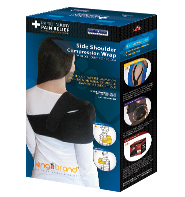 The Side Shoulder Wrap comes with three swappable gel packs that are custom designed to conform to the shape of the side of your shoulder. The unique design of these gel packs ensures the best treatment and coverage possible. The wrap molds the gel pack around your deltoid, rotator cuff and the upper portion of your bicep, to ensure your entire injury receives an even distribution of cooling power. We have two different Shoulder Wraps that target two different areas. While this page is dedicated to the Side Shoulder Wrap, we also have a Top Shoulder Wrap. Generally speaking, if you have a Deltoid injury or Upper Bicep Tendinitis, you should use the Side Shoulder products. If you happen to have a Supraspinatus or Infraspinatus injury, or a case of Frozen Shoulder, you should use the Top Shoulder products. It all depends on what area you need to target. Rotator Cuff injuries are a bit more tricky, as it depends on which part of the Rotator Cuff is injured. Pay attention to where the pain is. Is it closer to the "side" or the "top"? Use the coverage zone image above to determine if the Side Shoulder Wrap would cover the painful area. The Side Shoulder Wrap comes with 3 Extension Straps that allow you to customize the fit of the wrap. This makes it easy to find the perfect fit for your unique body shape. Some people won't need much extension, while some people will need more, which is why we include a Small Strap, a Medium Strap and a Large Strap with every Side Shoulder Wrap. Only ColdCure® Wraps come with XC RigiGel® packs. XC RigiGel® is unlike any other gel formula. Our unique technology makes it soft and moldable to the touch, yet unyielding under pressure. It molds to the exact shape of your shoulder but doesn't move out of the way when pressure is applied. While other gels will flow away from the injury when under pressure, XC RigiGel® always stays in place. This means your shoulder will receive effective, uniform relief of pain and swelling. ColdCure® Wraps use both cold and compression to provide fast, effective relief of pain and swelling. This is the first step towards healing. While most other products come with one or two gel packs, the ColdCure® Wrap comes with three. This means unlimited use. While you're using one pack inside the Wrap for your treatments, you always have two more charging in the fridge or the freezer. The three massive gel packs included with the Side Shoulder Wrap are also significantly larger than store-bought packs, meaning they cover more of the injured area. Gel packs stored at refrigerator temperatures can be used inside your Wrap continuously. Treatments can be cycled back-to-back with no need for breaks in between. All you have to do is swap the gels in and out throughout the day to keep your cold therapy going. Gel packs stored at freezer temperatures can be used inside your Wrap in 20 minute cycles of use and rest. Wear the Wrap for 20 minutes, then take a 20 minute break. Cycle treatments like this throughout the day. ColdCure® Wraps come with a 1 Year Manufacturer's Product Quality Warranty. Please feel free to contact us any time if you have any questions regarding our products.